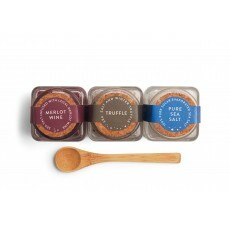 3-jar combination set consisting of 1-ounce jars of Truffle infused finishing salt, Merlot Wine Blend infused finishing salt, and 100% Pure Amagansett Sea Salt, and the perfect bamboo salt spoon that fits our jars. This set exemplifies luxury in three jars. The three jars and spoon are packaged together as a single unit with a clear shrink wrapped band.